Check it out--it’s the Disco Droid created by YouTuber chrisjrelliott! 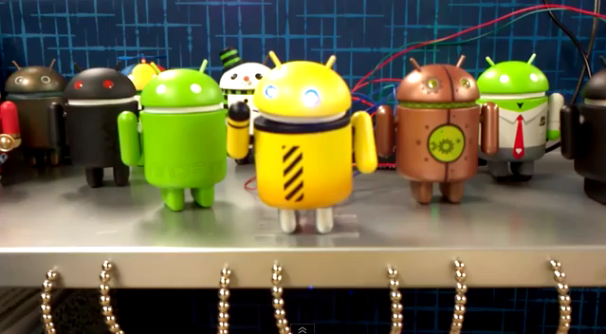 This plucky little Android mascot has been modded using the Arduino Development Kit and is controlled by a Motorola Xoom. The Droid has under gone a little torture--its eyes were drilled out for LEDs, and it's been fitted with four-point servo to rotate it head, arms, and body. While the Disco Droid waves it arms and blinks its little head off, it’s completely controlled by sliders on what looks like a custom interface on the Xoom. Unfortunately, the “build instructions are in progress and the code will be open-sourced shortly.” But chrisjrelliott also mentions that the whole Droid crew in the background will also be dancing soon.